We’ve started harvesting lots of kale (you can learn how to preserve your kale for up to a year), carrots, lettuce, herbs (basil, cilantro, thyme, oregano, etc). Sadly most of our lettuce has bolted and our strawberries have reduced growing considerably. I believe the strawberries are a ever bearing variety so we should continue to get some throughout the season. To follow some harvesting updates follow along on instagram! My goal is to weigh all of our fruits and vegetables to see how much we have harvested. I created an excel sheet where I am imputing all of my data. Then I can compare year to year and determine what has worked what has not and learn from my mistakes. Which I may have made a few this year already… Oops! I started some squash seeds early transplanting the seedlings in May and 2 plants were direct sow a little later. The seedlings that transplanted had a rough start. One was attacked by squash bugs and didn’t survive it, the others seem to be doing pretty good, but the direct sow ones are much healthier and I have already harvested a few squash even though they were started much later. And as of the other day, just when I thought our squash bug problem was over… another casualty was taken… This time cantaloupe! Next year, I will direct sow the squash in June to avoid those stupid darn squash bugs. Those stupid squash bugs, aphids, white spiders…. Aphids, white spiders, eggs, oh my. Make your own bug repellant/insecticide. Not only does bug repellant keep away the bad bugs it also keeps away the good bugs so use sparingly! 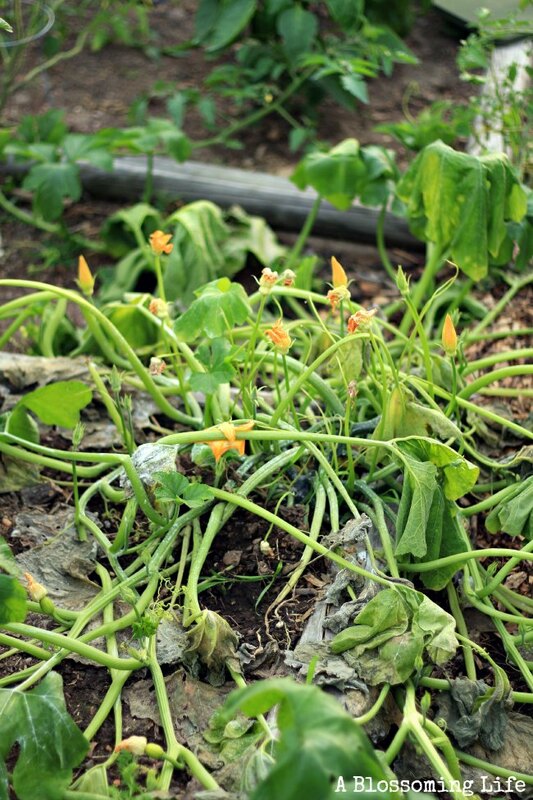 Diluted castile soap diluted with water will kill squash bugs! Seriously… Kills them on the spot. So does smashing them :). Diatomaceous Earth. Diatomaceous earth is fossilized remains from diatoms and can be used in the garden as a natural insecticide. Basically it works by the insect’s exoskeleton absorbing the powder causing the insect to dehydrate and die. Problem is that it can kill bees too. So if you apply it to a plant make sure to cover the plant so you only kill those bad squash bugs and not the precious honey bees. Many of my tomatoes got septoria leaf spot. Not sure if it because before I knew what it was, I thought the spots were from the aphids and just cut them or pinched off the stems while I was pruning. Either most of the tomato plants already had this or I spread it… Duh duh duuuhhh. Yea lesson learned! From now on I will be cleaning my tools between plants to avoid spreading this fungus! The link above shows what septoria leaf spot is and ways to treat it, including organic ways. Need more tips for your garden? 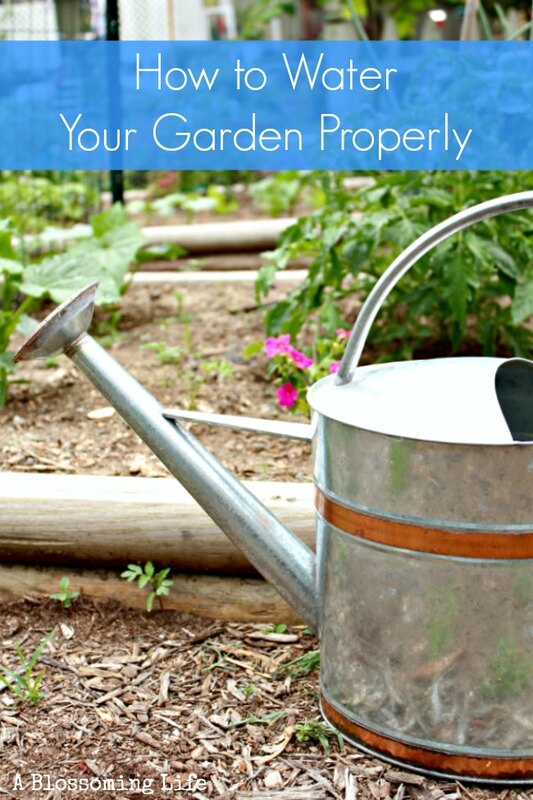 Check out How to Water Your Garden Properly! 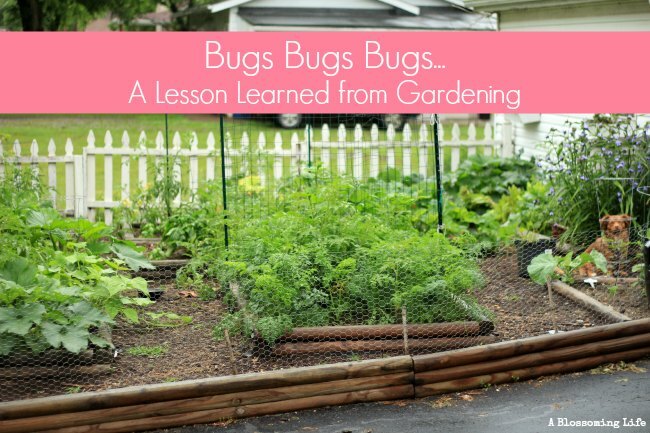 What lessons have you learned gardening? This Post contains affiliate links. Affiliate links help support my blogging without any extra cost to you! Thanks for the duct tape idea, that was something I had not thought of so far…As our climate changes and winter and summer are affected we will see the rise of more garden pests and diseases. Managing the eco-system to keep them at bay is going to be more and more crucial. That doesn’t surprise me at all Charlie! The mosquitos are absolutely terrible here! My neighbor has sprayed every super intense, terrible for you bug spray and nothing works! Hopefully more people will start to go the natural route to decrease the amount of climate change we experience! I wanted to swing by and thank you for sharing my Berries & Ice Cream Pie on your Google+ page! I appreciate the support. I love this post. My little ones and I planted a potted garden in late March and we’ve been enjoying it tremendously. I/we’ve learned a lot, too! My kids have learned the value of patience and how to properly remove fruits and vegetables, so as to not hurt the plants. And me . . . I learned a TON about caterpillars and how destructive they can be to tomato plants. I thought I had removed them all, from one plant in particular. Only to find that in a matter of a week the whole plant turned the ugliest shade of yellow/brown.orange. Apparently, they lay larva on the underside of the leaves, leaving a constant flow of little caterpillars hatching and growing (right under my nose). I had to take drastic measures to save the plant(s), so I stopped by my Armstrong Nursery and bought ‘Captain Jack’s DeadBug’ Organic Brew. I spray it on my plants once a week. The great news . . . my tomato plants are healthy again and bug free!! We’ve been enjoying a BIG crop of heirlooms the last few weeks. Please stop by my Facebook page and check them out. Thanks so much for the GREAT gardening post!! No problem Suzanne! That is so fun and there is always something to learn! We haven’t harvested any tomatoes yet! I will need to look out for those darn caterpillars. I had a similar experience with tomato horn worms… One day 10 beautiful tomatoes that were almost ripe the next day there was none! 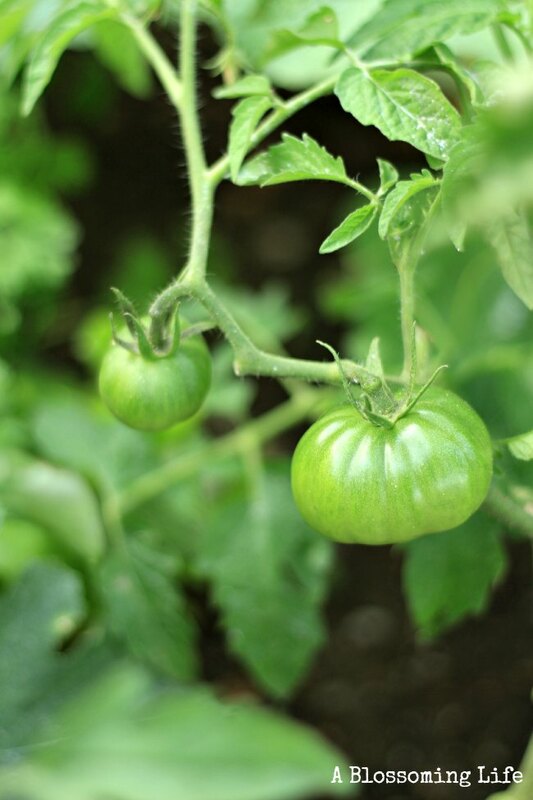 Those boogers ate all of the tomatoes in 1 day! Thanks so much for coming by and sharing that with me! Always fun to meet other gardeners and learn something from one another! Wow, these are some great lessons! And I’m amazed at the progress of your Tomatoes and Cucumbers. I’m in Wisconsin, so my vegetable garden is a little slower. I host the “Garden Lessons Learned” meme, and this would be a great addition. Let me know if you’d like me to feature this post in a wrap-up post for the meme. Happy Gardening! Knock on wood, I haven’t had any issues yet this year! 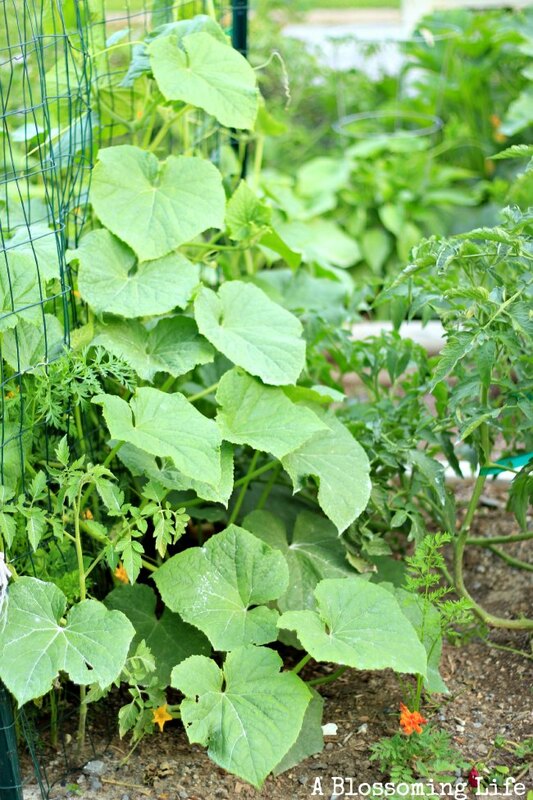 I love learning any new gardening tricks – thanks for sharing!